Looks to me like they included an actual puck in the package. 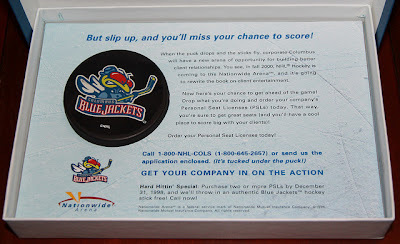 Considering that the team didn't hit the ice until October 2000 and the deadline for the early PSL subscription promotion was New Year's Eve 1998, that's not a bad way to get the word out. It's not like they had much more than a logo to market at that point. Thanks for the contribution, John! 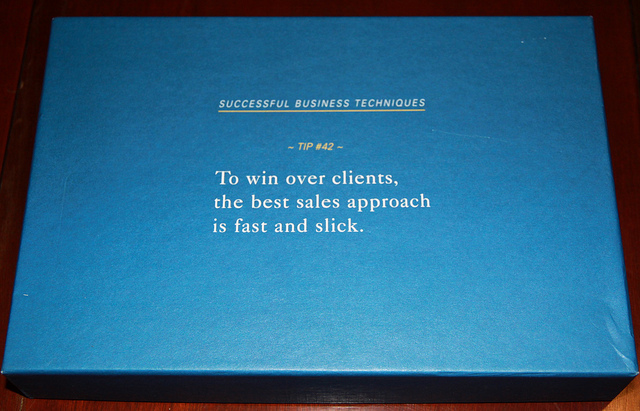 This blog exists to highlight the stuff that's sitting on our shelves, in our shoeboxes and - umm - as our doorstops. It's the quirky history of the Columbus Blue Jackets brought to life. If this blog is going to work, I'll need your help. Email your photos of CBJ other memorabilia - the older the better - to me at cbjmemorabilia [at] gmail [dot] com, and I'll post 'em for you. If you happen to have a story about how you got the item, or a favorite recollection of the ex-Blue Jacket whose memorabilia that you're sending, feel free to share it as well and I'll post. Over time, we'll have a place where we can share our memories of our favorite NHL team, the Columbus Blue Jackets. Carry the Flag! This blog is in no way endorsed or supported by the Columbus Blue Jackets, the National Hockey League or JMAC, Inc. All copyrights and trademarks are held by their respective owners, and hopefully those same people realize that this is a tribute blog that has only the noblest of intentions.